The waist-high grass spun, shifted, and swirled in the wind rushing over the open savanna. The blades cut at my shins as I traced a faint game trail next to an old drainage ditch. Miles of grassy bog stretched around me and I wondered how to find a trail that might not exist at all. I stared at that bent metal sign for a long time last night feeling bitter and angry. I’d pulled off what people told me was impossible. I’d crossed a hundred deadfalls, pulled myself over bogs, and dragged the boat through mud three feet deep to reach an exact point in the middle of a forty-square-mile swamp. I’d done everything I was supposed to do and the world betrayed me, left me a bent metal sign and no trail. But staring at a sign will not bring civilization to you, no matter how angry and bitter you are. When I sunk to my thighs in mud and water as I struggled over the first deadfall, I knew it would be difficult to go back. After the hundredth, it became unimaginable. Cortez burnt ships, Roman generals crossed the Rubicon, and I crawled through a swamp until I couldn’t give up. That sign waited with my equipment a half-mile away through a tangled marsh of grass and trees. The distance seems so short, just ten minutes on a sidewalk, but even without the boat it took me an hour in the savanna. With the boat, it would take two, maybe three. That’s why trails matter in the wild. A blur of brown movement slid into the grass and disappeared. I crept closer and a bobcat sprung away in two quick leaps. I’d never seen an animal move that fast. It’s muscles exploded with such power and grace that I wondered if it were a ghost. I looked around, suddenly conscious of the wild surrounding me, of how rare man’s footsteps were. Then a piece of wood floating in the water caught my eye and stopped my breath. One end barely hung on the surface, but its edges were cut in straight lines. It wasn’t a tree, wasn’t a log or branch. It was a manufactured piece of wood, square and sharp against nature’s curves. It reeked of civilization. I stepped closer and followed the board into the water to the shimmering outline of a sunken footbridge. Algae coated the wood and a foot of water covered it, but it held my weight as I picked my way across missing planks and broken boards to the other side. On the far side, the bog of grass swallowed me to the knee as I searched for something, some small trace to follow. I stumbled and plunged and sunk. The mud sucked at my legs, everything felt loose and wet. Nothing held until my foot landed on solid ground and I pulled myself up onto a hidden plank of wood, a board, a long, thin board covered in mud. I felt it with my feet in the grass, tracing its outline in the bog as I pressed and searched for something solid. It gave way to another plank, and another, and another. I stepped forward, trying not to believe, but knowing, knowing that it was the trail, that I’d found it, board after board, hidden under the muck of bog and grass, solid where nature is soft. I rushed forward, almost running as the bog gave way to trees, as the boards gave way to solid ground, as the wild gave way to the faint edge of civilization. Posted in Angle to Key WestTagged AKW September, Angle to Key West, bobcat, civilization, portages, savanna portage, wildernessBookmark the permalink. Great stuff! I look forward every day to reading more. and more. You give us enough, but I’m always looking to get more and that is the sign of an excellent writer. It’s a good thing I have great faith in your abilities, Daniel! Whew! Congratulations!!! The bob cat photo was incredible, too!!! I am enjoying every entry. Holy sh**! That was incredible. I’m so happy and relieved you found the trail. Thanks Steve! Your map was great and you were right about it getting a lot better after the beaver dam! Um, that’s not a bobcat–it’s a Mountain Lion (or Cougar)! ! ! The tail just seems too short though, doesn’t it? Here is a video of it jumping out, but it is so quick that you can’t see much of anything there. I agree. It looks more like a cougar. A bobcat should have more markings on the body and be shorter, stalkier. Looks more like a couger (puma, mountain lion)!! ..you have true grit …and that was a cougar – we still have a few in N. Florida ….Bobcats had long , furry ears , with tufts …maybe see you in Pensacola� when you come thru on the inland waterway ………. I enjoyed the video on the bob cat/cougar. We were looking it up last night to see which one it was… Either way, great to see!!!! Jeff said it best – You have True Grit. And the gift of storytelling – non fiction. I get a grin on my face every time I see you’ve posted an entry 🙂 Suddenly, in the middle of an ordinary day, I am transported. Thanks! The animal in the photo is a Puma concolor. What a great adventure… I’m having a blast following along. 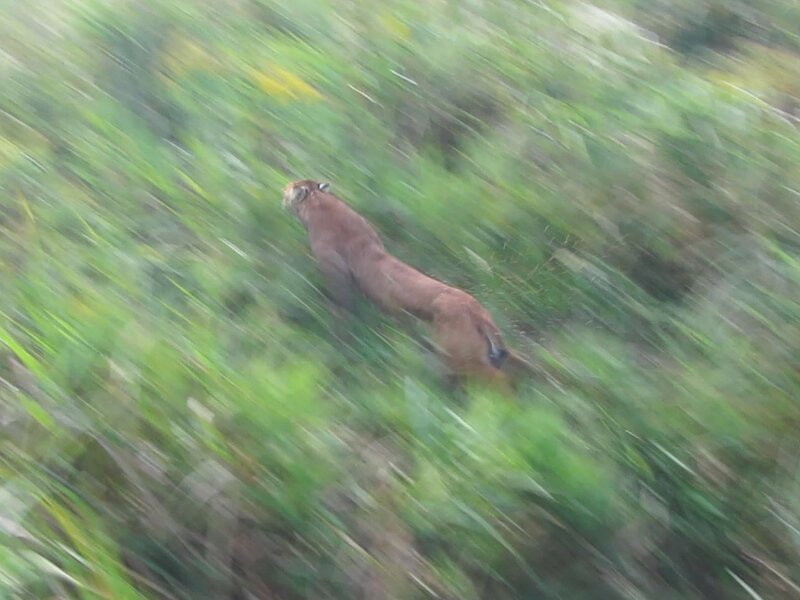 And lucky you for seeing a mountain lion… not many get that kind of experience! Also, thanks for bringing attention to protecting the route! My wife and I lvie downtown Minneapolis and love paddling that section of the Mississippi.